Operation Song™ is a 501(c)(3) non-profit based in Nashville, Tennessee. Our mission is to empower veterans, active duty military, and their families to tell their stories through the process of songwriting. Operation SongTM songwriting programs create an opportunity to transform service related issues, injuries and illnesses into a structured, musical outlet as an enhancement of traditional therapies and/or treatments. Since 2012, we have written over 600 songs with veterans of WWII to those currently serving. We hold weekly workshops in Middle Tennessee and sponsor events and group retreats throughout the U.S. Those we serve need no musical background, only the desire to tell their story. Songwriting has done more for me in two months than the shrink did in two years. This is therapy on steroids. This is my liberation song. Words cannot express how valuable and precious this experience has been for me. Never through my husband’s military career has anyone sat and asked me to tell my story as a military wife. Just wanted to say I keep finding guitar picks in the dryer…. Three today alone. He has been practicing his song and last night when he couldn’t sleep he pulled out a note book and was SONG WRITING. Jackie L. military spouse and caregiver. Now I don’t have to think about it, I can just listen to my song. Patty.M., Military Sexual Assault survivor. A tribute song for Memorial Day written with six veterans of Vietnam, Iraq, and Afghanistan at the Alvin C. York VA Medical Center in Murfreesboro, TN. Vocal by Ward Davis with veterans Jimmy Ray Sells and Ian Wagner. 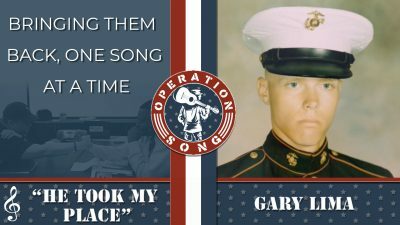 Check Out Operation Song 2018 In Review! Our latest CD “We Got Your Six” is now available on iTunes , iTunes Music, and Spotify. Help us continue to serve those who have served. Please, support the mission today!